The Olympic Torch has its origin in ancient Greece where a fire was kept burning through the celebration of the first Olympic game. And since 1936 when the first modern Olympic Torch was said to have been used in Berlin, there seems to be an established custom of torch-lighting at every Olympic games and at some smaller athletic games. Torch lighting and relay during inter-house sports competition are not new at Loyola Jesuit College: we always light a torch to start off our inter-house sports competition as we did at the recent 16th edition of the annual event. 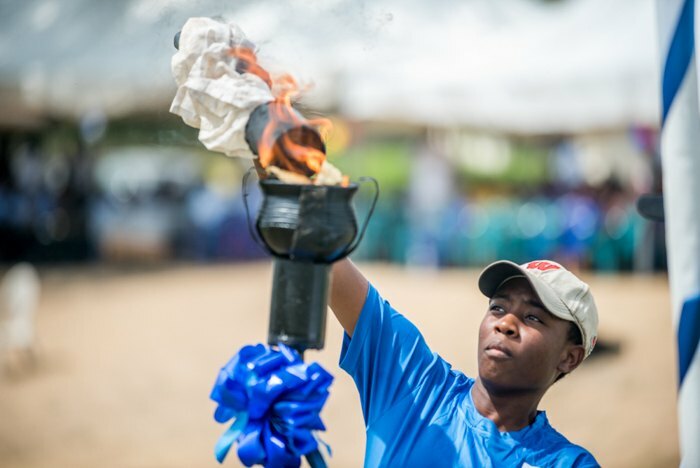 As in every other sports competition where a torch is lit, the symbolic light guides LJC athletes and the whole community through the various events of the day. I was given the honor to light the cauldron with the inter-house sports torch in order to serve as a gateway for the athletes to succeed. The light, as I see it, is God’s presence in our midst and an invitation that we should shine forth as a light to the world through the celebration of our talents. The torch, furthermore, gives encouragement to the athletes and leads them to carry on without giving up. It was another opportunity to celebrate and discover talents to the greater glory of God.